Given the release of Star Wars: The Force Awakens last night/today I have been refreshing my mind on all things Star Wars before I see the seventh episode tomorrow. It’s been a few years since I last saw the films in full, and that’s where this article stems from. One of the most intriguing pop culture questions in history is the correct viewing order of the Star Wars franchise. Given that there’s six films from very different eras, there are similarly different camps on what to do. The primary sides are Release Order and Episode Order. Star Wars started in 1977 with episode four, then released five and six over the next few years. It was only in 1999 that episode one hit theaters, with episodes two and three seemingly rounding out the series by 2005. This makes a great deal of sense – this is how everyone had to watch the films over time. However, given the narrative runs chronologically from I-VI, the latter camp has some validity immediately, although the first three films are the weaker half of the series. This is where the Machete Order comes from. Because I seemingly did not know how the internet worked for the last few years I missed the blog post that detailed a new way in which to appreciate the Star Wars franchise. The idea is to frame the films as Luke Skywalker’s story, beginning with episodes four and five, before reaching the climax of Darth Vader and his reveal. The viewer then goes back to the second and third episodes to see how Luke’s father Anakin Skywalker became Darth Vader. This strikes me as fascinating, especially because it leaves the resolution of the cliff hanger for a much later time. This allows both portions of the story – Luke’s and Anakin’s – to be told to roughly the same point before finishing everything off with Return of the Jedi. Best of all, this apparently allows for some of the details of the stories to remain intact, unspoiled, while making other aspects stronger. I don’t want to steal credit from the author, so more details of how this order works can be found here. 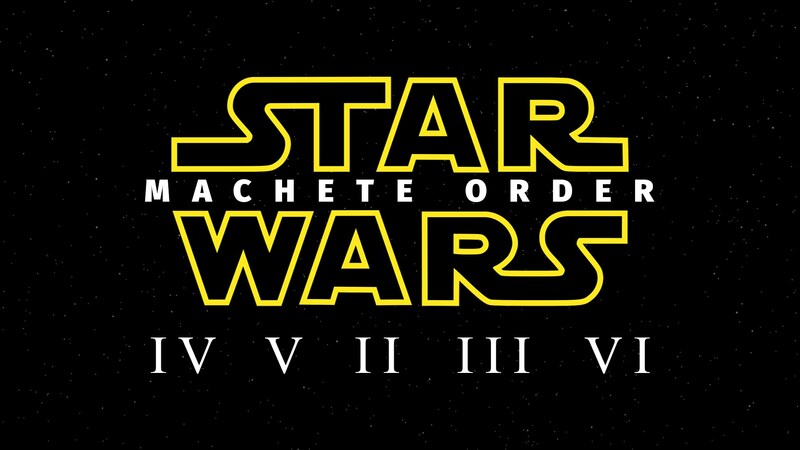 Due to timing with exams I haven’t tried the Machete Order out personally, yet. The funniest and arguably best part of this theory, however, is that the author suggests cutting out The Phantom Menace entirely – a move that I think roughly everyone that has seen the movies would be down for. But most importantly I find all of this an interesting exercise in how we consume to pop culture. All of these internet theories, ideas, conspiracy theories, concepts, etc. all become ways in which we interact with texts. So much of our viewership is simply watching stuff, but where’s the fun in that? Give me debates, give me brackets, give me drawn out ideas like that Walter White is actually Malcolm from Malcolm in the Middle as an adult. There might not be a more beloved and debated franchise in film history than Star Wars. So if someone could find a way to potentially reinvent the way we react to a revolutionary part of Americana I am all in. You don’t have to love it or like it even, you just need to give some props, and maybe pop in those DVDs to see Star Wars in a brand new way.